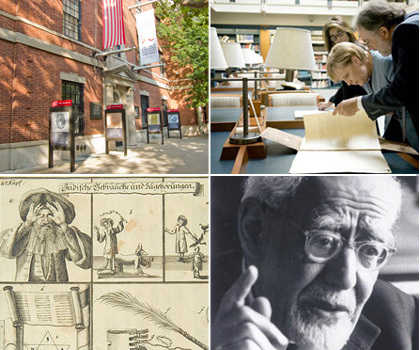 The Library of the Leo Baeck Institute, New York (LBI) is the foremost research library devoted to the history of German-speaking Jews. Its 80,000-volume library and extensive archival and art collections represent the most significant repository of primary source material and scholarship on the Jewish communities of Central Europe over the past five centuries. German-speaking Jews had a history marked by individual as well as collective accomplishments and played a significant role in shaping art, science, business, and political developments in the modern era, as evidenced by the continuing relevance of figures such as Moses Mendelssohn, Albert Einstein, and Franz Kafka. LBI is committed to preserving this legacy and has digitized over 3.5 million pages of documents from its collections—from rare renaissance books to the personal correspondence of luminaries and ordinary people alike, to community histories and official documents. A large portion of these collections were digitized by and are hosted here at Internet Archive. Photocopies of two mohel books, one by Naftali Herzl with entries from 1821-1869, the other by Moishe Neufeld with entries from 1882-1924. The Julius Buchwald Collection consists of manuscripts, musical compositions, family correspondence, and printed materials. The bulk of the collection consist of Julius Buchwald’s writings and musical compositions, most of which were composed in the late 1930s. Julius Buchwald was born in Vienna, Austria in 1909. He immigrated to England in 1940 and moved to the United States in 1944. He was a poet and a composer. He also won numerous prizes at chess problems competitions. He died in 1970. Personal and official documents relating to Arthur Wolf; diaries and correspondence. Two letters by Heimito von Doderer to Hugo Knopfmacher, 1960-1961, removed to the LBI Autograph Collection. The Toni Stolper and Gustav Stolper Collection attest to the Stolper's rich political and intellectual work in Germany and the United States. The materials provide an intimate account of Toni Stolper's life and carrer. In many respect they complement the papers of her husband Gustav Stolper, which are located at the Bundesarchiv in Koblenz, Germany.